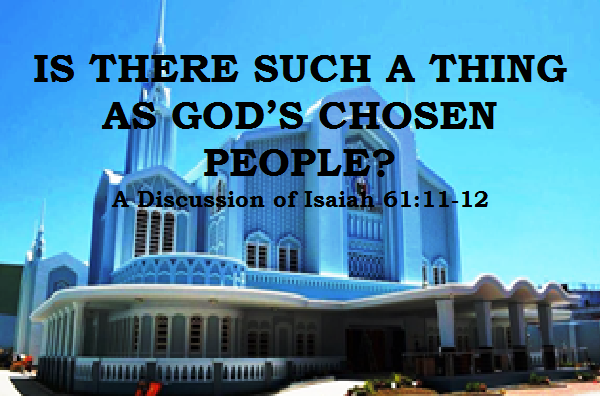 IS THERE SUCH A THING AS GOD’S CHOSEN PEOPLE? “Remember that the LORD has chosen the righteous for his own, and he hears me when I call to him” (Psalms 4:3 TEV). This is the importance of the election from God. Only those chosen will be heard by Him. That is why for any organization or church to have the right to serve God, it must be chosen by Him. What people do not realize is that this has been God’s policy ever since ancient times. “No longer shall your name be called Abram, but your name shall be Abraham; for I have made you a father of many nations. “And I will establish My covenant between Me and you and your descendants after you in their generations, for an everlasting covenant, to be God to you and your descendants after you (Gen 17:1, 5, 7). God established a covenant with Abraham and his descendants that God will be their God and Israel will walk before Him and be blameless. But, did Israel fulfill their end of the covenant? “...all Israel has transgressed Your law, and has departed so as not to obey Your voice; therefore the curse and the oath written in the Law of Moses the servant of God have been poured out on us, because we have sinned against Him (Dan 9:11 NKJV). “I am the vine, you are the branches. He who abides in Me, and I in him, bears much fruit; for without Me you can do nothing (John 15:1, 5 NKJV). Therefore, the Church of Christ in the first century had the right to serve God because it was planted or chosen by Him. It had the prophetic word made sure. In other words, it was the fulfillment of biblical prophecy. However, did the first-century Church of Christ remained as God’s nation or they also end up like the ancient nation of Israel? We have seen what happened to God’s first nation, the ancient nation of Israel, they did not remained faithful to God, thus they did not remained God’s nation. Israel was replaced by the first century Church of Christ as God’s nation, but the first-century Church of Christ end up like the ancient Israel, they did not remained faithful to God, and thus, they did not remained God’s nation. Who is God’s nation after the first-century Church of Christ was apostatized? Is there a nation of God in these last days also confirmed by biblical prophecy? The prophecy mentioned a “Holy People.” Are they the ancient nation of Israel? No, for the “Holy People” mentioned are those the Lord “has proclaimed To the ends of the world.” As we have seen, the ancient nation of Israel did not remained as God’s holy people and replaced by the first-century Church of Christ. Are they the first-century Church of Christ? The first-century Church of Christ did not also remained as God’s holy people. Apostasy overtook the first-century Church. What was our Lord Jesus Christ’s answer to the question of the disciples? The First World War was unique in many ways. It was the first war global in scope, and the news of this war was heard all over the world. When did the First World War begin? Thus, as the election or being God’s chosen people of the first-century Church of Christ was confirmed by biblical prophecy, the election or being God’s chosen people of the Iglesia Ni Cristo (Church of Christ) is also confirmed by biblical prophecies. This is the reason why we firmly believe that the Iglesia Ni Cristo (Church Of Christ) is God’s nation in these last days.